Cauliflower Rice is the perfect low-carb alternative for regular rice. For this Oven-Roasted Cauliflower Rice with Za’atar Chickpeas, I’ve used two small heads of cauliflower. 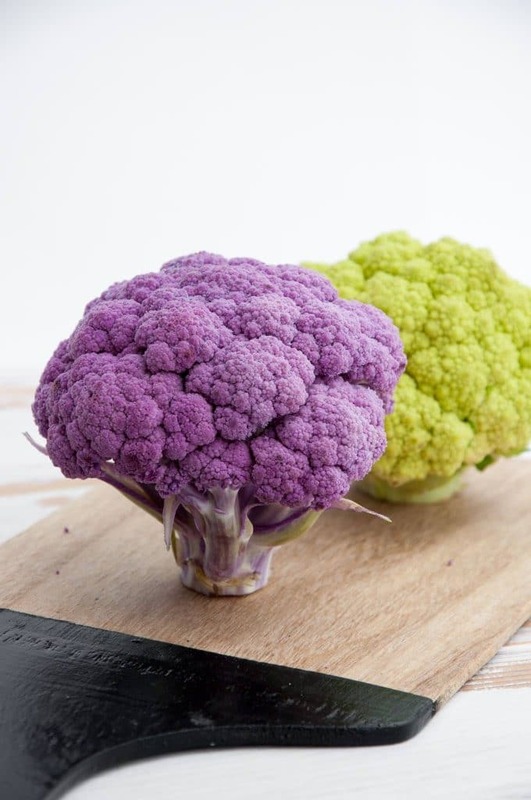 When I found these cute little purple and green cauliflowers in the store, I KNEW I had to take them. What would I do with it? That’s a decision for later. I rarely have a recipe in mind, when I buy ingredients. Buy first – think later. Not always the best way to do grocery shopping – but that’s my style. So with these gorgeous colorful cauliflowers in the fridge waiting for me, I knew I wanted to make a dish in which they keep their color and are the star of the meal. Cauliflower rice – the super trendy low-carb alternative to regular rice came up. I always wanted to give it a try, so this was the perfect opportunity. I love how they look like a tree – and every small floret looks like a tree too… so it’s practically a forrest in a tree? Whaaat?! This is getting too confusing.. back to the cooking. I’ve blitzed the cauliflower in the food processor until small, tossed them in olive oil and salt and lay them flat on a baking sheet and baked them until crispy. Easy peasy! I also had an open can of chickpeas in the fridge, which needed to be used up. I’ve had been saving these for crispy chickpeas and again, perfect timing. As I was making the cauliflower rice in the oven, I made the chickpeas at the same time to save energy and time. 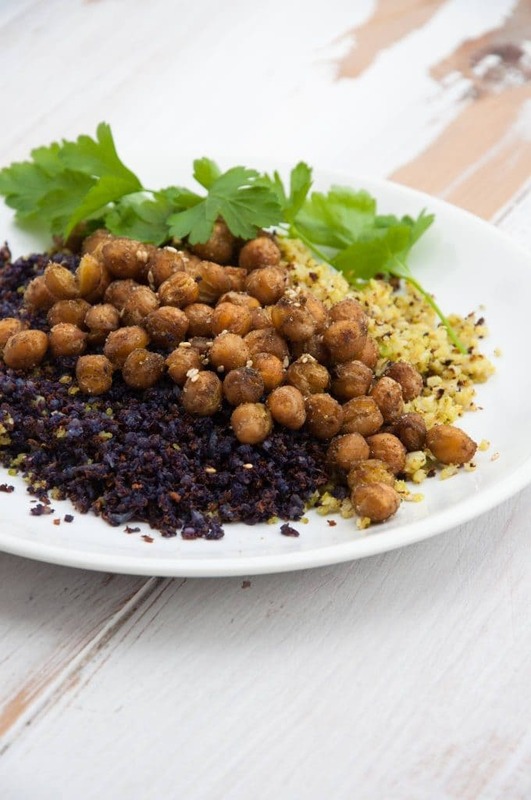 I’ve tossed the chickpeas in Za’atar seasoning, which gives it a lovely mediterranean vibe! Cauliflower Rice is the perfect low-carb alternative for regular rice. For this Oven-Roasted Cauliflower Rice with Za'atar Chickpeas, I've used two small heads of cauliflower. Wash the cauliflower and remove the core. 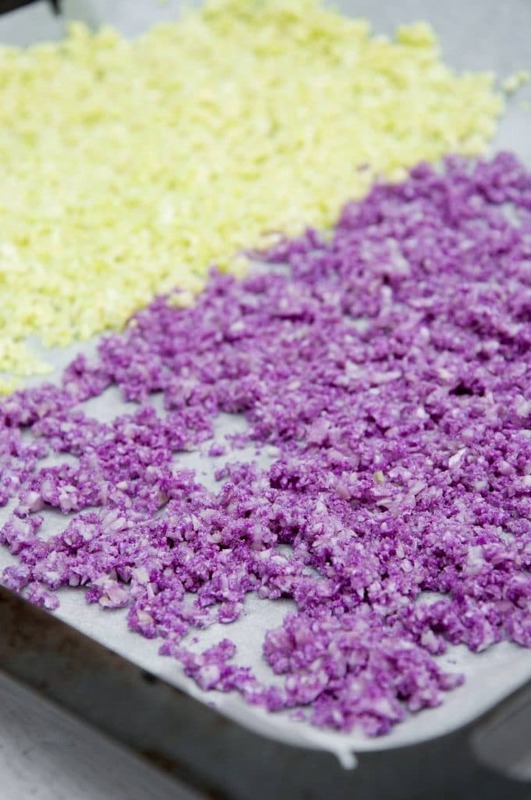 Cut the cauliflower in florets and blitz in a food processor until fine. Transfer the cauliflower in a bowl, add 1 teaspoon of olive oil and 1/2 teaspoon of salt and give it a quick mix. Transfer it on a baking tray lined with parchment paper and lay as flat as possible. 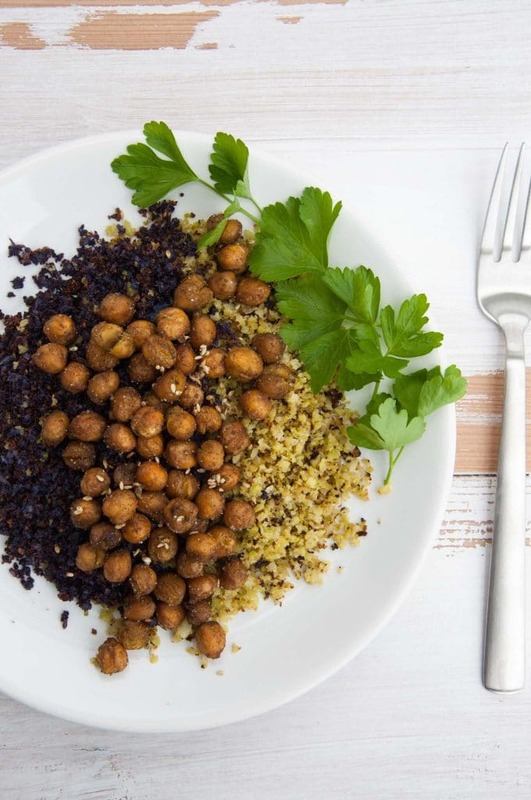 Put the chickpeas in a bowl, add 1 teaspoon of olive oil and the za'atar seasoning. Put the chickpeas on another baking tray lined with parchment paper - lay flat and bake in the oven, together with the cauliflower rice for about 25-30 minutes. Keep an eye on them and stir around the cauliflower rice a couple of times when it's getting brown. The chickpeas are ready when they are crispy. 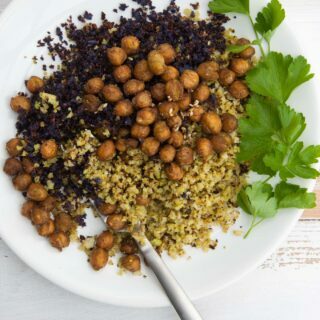 Once everything is ready to serve, put the cauliflower rice on a plate, add the za'atar chickpeas on top and garnish with fresh parsley. 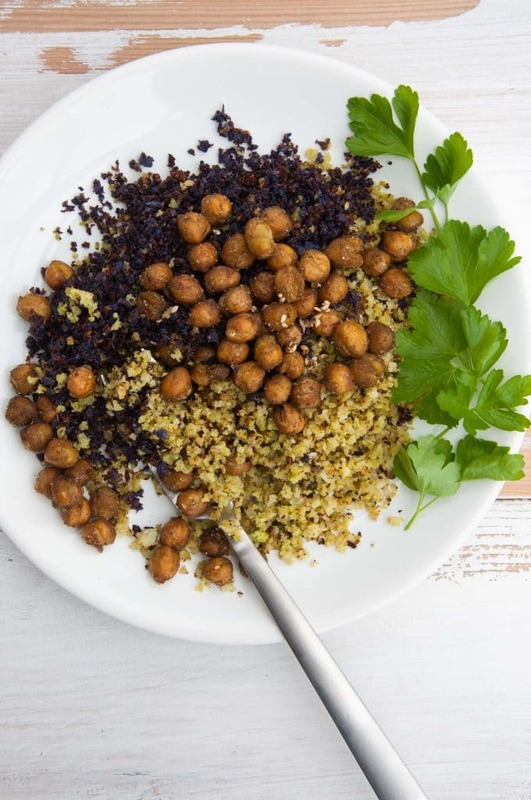 Did you make the Oven-Roasted Cauliflower Rice with Za’atar Chickpeas? Tag @elephantasticvegan on instagram and use the hashtag #elephantasticvegan. Don’t forget to subscribe to the Elephantastic Vegan Newsletter to see Reader Remake Features! Thank you Natalie <3! It was my first time trying cauliflower rice (late to the party, as always) and I was afraid it would be too mushy or clumpy in the pan, so I went the safe way with the oven. It was delicious. The cauliflower rice had crispy bits <3 Yass! Thanks to my buy first-think later method, I still have green pandan-colored rice in the pantry which I’ve never used..and I bet I have tons of more weird things (which I’ve forgotten already).